Fresh asparagus shines in this healthy, make-ahead vegetable entree. 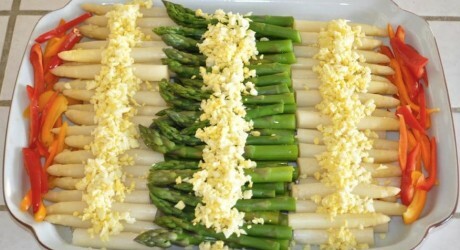 Clean the asparagus and discard the tough base parts. Cut the asparagus stalks into the size you prefer. Three to four inches is a good size for this dish. Bring a pot of water to a boil and then boil half a pound of asparagus at a time, cooking each batch for 1 or 1½ minutes. Then immediately remove the asparagus from the boiling water and place into a large bowl or pot of ice-water to bring down temperature. This will preserve the crispness of vegetable. 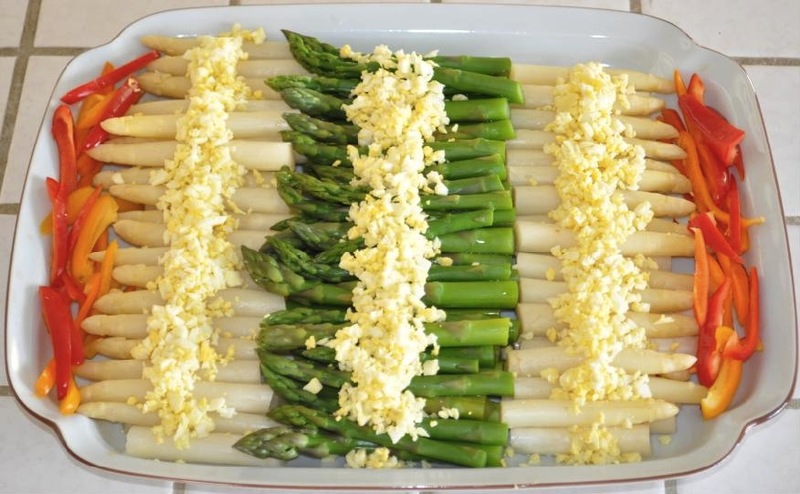 Arrange cooked asparagus on a big plate, then top with chopped eggs. If desired, decorate with colorful vegetables or fruit, such as red and yellow peppers or cherry tomatoes. Top the eggs with dressing before serving. Makes 12 to 15 servings. This recipe is great for parties because it can be prepared beforehand and stored in the refrigerator. Keeping the vegetable crisp is the key to this dish. Sometimes it can be difficult to find white asparagus. You can use Japanese or Persian cucumbers as an alternative or simply green asparagus alone.